This is one of the most beautiful swords found in Finland. It was found, I think, in a grave at Pappilanmäki, Eura. I've been wondering for a long time about the peculiar shape of the crossguard. Has anyone seen anything like it, because I haven't. I found this pic online, but I will try to scan a better pic from a finnish history book. I don't know much about that crossguard but I do know that there have been some very interesting Finnish swords found, a lot of the time it seems they imported the blades from bladesmiths in western europe but attached their own fittings. It looks a bit later than 1200 to me though. 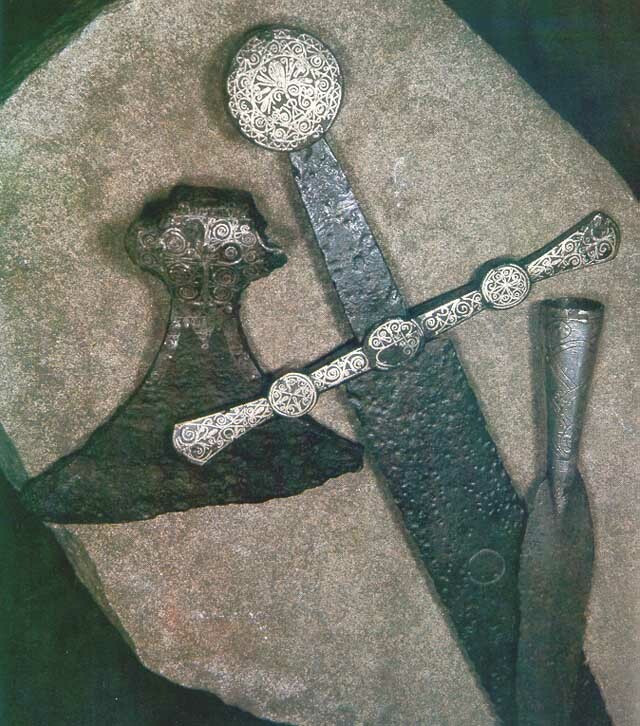 There is at öeast one other sword with a similar hilt, also worked in silver. A sword found at Kaukola, Koverila, Kekomäki. Sorry, not able to post pic. My scanner is not in the mood. This other one has a grip (hollow ?octagonal? tube) also in iron with the same type of silver decoration. The medallions of the guard are octagonal instead of round. Same type of pommel. There are some incredibleaxe heads with the same silverwork. Seems to have been a tradition of a workshop or small group of craftsmen. The two swords are so similar I think there is little doubt they were made by the same craftsman. Stunning weapons of incredible precense. To me it seems there is a strong russian influence in the style of these weapons. Thanks for the info Peter. I don't remember seeing that other sword. Do you know about it's whereabouts and what book has it's pic? I've seen those axeheads live and you're right, their decoration does resemble that seen on the sword this topic is about. Too bad it was at a time I didn't know as much about weapons as I do now. I'll have to dig up some more info on these things. XVI Tappara, miekka ja keihäänkärki Suomesta ristiretkiajalta. -- Tappara kuuluu leveine terineen yleiseurooppalaiseen aseistukseen ja sen käyttö tunnetaan hyvin Bayeux'n kuvakudoksesta Ranskasta. Raskas miekka on täkäläinen loistoase kahvan monimutkaisine kasvikoristeluineen. Keihään putki on peitetty ohuella hopealevyllä ja siinä on myöhäistä eläinkoristelua. -- Kuvassa ovat tärkeimmät 1000- ja 1100-luvulla käytetyt aseet. Löydöistä päätellen kilpeä ei käytetty, ei myöskään taisteluveistä. Keihäänkärki: Satakunta Kokemäki Leikkimäki, KM 1174:8. Miekka: Satakunta Eura Pappilanmäki, KM 65. Tappara: Varsinais-Suomi Masku, KM 8656 hauta 47:5. XVI Ax, sword and spearhead from Finland, from the time of the Crusades. -- The ax with its broad blade belongs to common European armament and its use is well known from the Bayeux Tapestry in France. The heavy sword with the complicated plant motifs of its hilt is a local luxury weapon. The spear's socket is covered with a thin sheet of silver and bears late animal motifs. 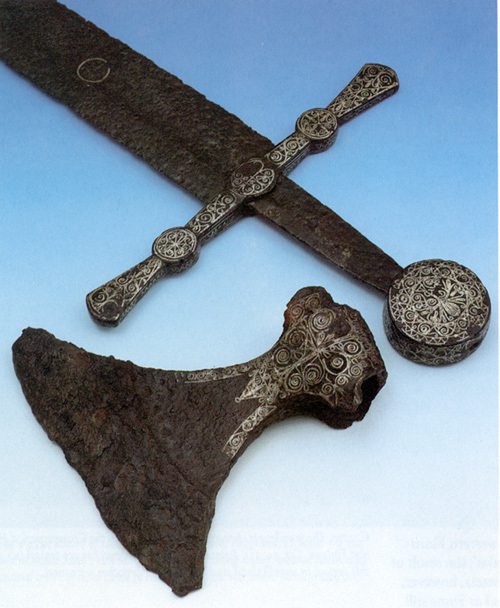 -- The picture presents the most important weapons used in the 11th and 12th Centuries. Judging from finds the shield was not used, nor the war seax. Spearhead: Satakunta Kokemäki Leikkimäki, KM 1174:8. Sword: Satakunta Eura Pappilanmäki, KM 65. Ax: Varsinais-Suomi Masku, KM 8656 grave 47:5. The KM stands for Kansallismuseo (National Museum of Finland), Helsinki. I'd post the picture itself but I've no access to a scanner right now. Mikko, thanks for the heads up. Here's the pic. You can also see an axe head Peter mentioned. Too bad there are no overall pics where you could see the whole sword. Do you have any idea what symbolic significance those discs on the crossguard might have? The holy trinity perhaps? Any more pcs as for a chance? I'm wondering if I could have it replicated. Sorry, none that I could find. That sword is very beautiful! I would love to see a fine reproduction of it. I am curious if any of you can tell if the discs are welded onto the surface of the cross or is the round shape of the disc part of the guard itself. I hope that makes sense. Hey, thanks Nick! Now I can see that the sides of the pommel were also decorated, cool! And I think that the same might go for the crossguard too! Now, if someone could run to the Finnish National Museum and take an overall pic. Now that I look at the shape of the crossguard it would seem that it has been made as a one piece. But that's just me. Hey, thanks Nick! Now I can see that the sides of the pommel were also decorated, cool! And I think that the same might go for the crossguard too! Now, if someone could run to the Finnish National Museum and take an overall pic. Definately a gorgeous sword, and also axe and spearhead. They still use the same gorgeous style of decoration as in earlier periods, which seems to have died out for the most part after the 10th or 11th century in most of Europe. Seeing it incorporated on a more modern style sword is quite interesting! I discussed this sword with an expert blademaker. As of first is aid that the crossguard is too wide for real combat, wielding that sword would mean getting hit by the crossguard end on the back of one's hand. He agreed totally and called it a cerimonial sword, seeing a comparison with celtic presentation sets that usually included an axe and a spear. As of first is aid that the crossguard is too wide for rela combat, wielding that sowrd would mean getting hit by the crossguard end on the back of one's hand. What do you mean by "wide"? Do you mean the length of the crossguard, from one end to the other? That's not even a very long crossguard. I mean one of my friend who trains Fiore with me has a huge crossguard on his hand-and-half Pavel Moc and he has absolutely no problems wielding it. You need to twist your wrist a bit to get the crossguard past your wrist with a crossguard like that. Sorry to say, but expert blademakers aren't necessearily expert swordmen. PS. I do intend to go to Helsinki to visit that museum some day with a camera, but right now I don't have the time. You are talking a sword with a long hilt: this sword has a short hilt, so I think it would be a different case from the one you are quoting. My low level hanwey has a short hilt and a rather wide cross, so I get occasionally tangled: incidentally this happeend to my teacher too. Shall it be a case that the guards tended to become downward sloped and not the contrary? I'm sorry, but I do not understand how does the length of the hilt ease the problem of a tangling crossguard? Your leading hand is still in the same place... I am still in the opinion of it being a matter of technique. A downward sloping crossguard would ease the movements a bit, but with proper technique a crossguard like that would not be a problem. I brought this thread up to admire the sword in question and noticed that Peter mentioned a similar sword found in Kekomäki . I decided to see what came up online and found a Russian site where someone has enthusiastically posted information not only about the sword we have before us, but also the Kekomäki blade, as well as another! A rough translation by Google shows that the sword we're discussing was discovered in the town of Pappilanmäk in 1911 in an area that contained both Viking and Crusader period grave finds. The author suggests that this created some controversy over the dating of the sword, but as five of the type have been found with three clearly coming from the 13th century, the later date is logical. The author then goes on to consider the dating and original location of the axe and spear head, which suggests some ambiguity - he/she believes the axe is perhaps as much as two centuries older than the sword. I personally cannot comment on this further because I do not know the style of axe well enough, and am unaware if there is any evidence to show that the items were not in fact discovered together. Concerning the sword discovered in Kekomäki (nearer the bottom of the page). X-rays have been taken to show that there are probably nine letters on the blade, and that they are mostly illegible, except for an N at either end, suggesting that NOMINE in some form created part or all of the text. The style of silver engraving is very like the example from Pappilanmäk It was also discovered with the chape shown in the photos. It's interesting to note that by road today the distance between the two finds is 200km and both would have been within the jurisdiction of the Kingdom of Sweden throughout most of the 12th-13th centuries, affirming a strong Christian influence in the region. Both are also several hundred kilometers north of Riga, where the contemporary German crusading orders based their major operations. A third, undecorated sword of the type is shown near the bottom of the page, and is noted as having been sold at Hermann Historica. The description said it was from Eastern Scandinavia, which fits the pattern nicely. Does the Russian article say anything about the dimensions of these swords? There are actually two swords of this type from the same burial ground in Kekomaki. The swords are described in an article in Russian by Anatolij Kirpichnikov. Both are held in the National Museum in Helsinki. The sword mentioned with the decorated hilt and inscription has the inventory number 2489:281 and is 96 cm long. The second is numbered 2489:121 and is 101.5 cm long. The hilt seems undecorated, though it may simply the result of more severe corrosion. There are unclear traces of an inscription on this blade also.